Reviving extinct species – future of science or fool’s errand? threatened by climate change. Whether some of these claims are overly dramatic or scarily close to the truth we do not know with certainty, but what is clear is the idea of extinction is central to the arenas of conservation and environmentalism. A species that has become extinct will never be seen again on Earth. Well, maybe not. A group of scientists and campaigners around the world have been working on the idea of ‘de-extinction’. Alba Charles writes about the technical and philosophical aspects of bringing back extinct species. On the flip side, Chris Bowden describes the efforts to prevent species – Asian V ultures – from going extinct. 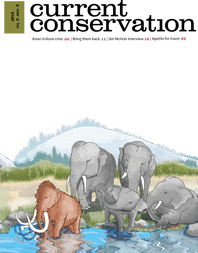 Hari Sridhar interviews Jim Nichols, doyen of quantitative ecology about using rigorous science for decision making in conservation. Matt Creasey takes a journey with the rufous Hummingbird, a remarkable 8000 mile round trip for a 3 gram bird. And finally, focusing on another species that has been threatened with extinction,Caitlin Kight reviews a book on the future of cheetahs by Laurie Marker.